Made from recyclable card (environmentally friendly). 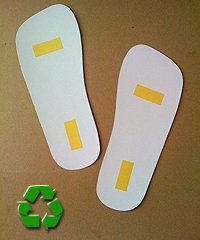 NEW sticky feet have 2 strips of tape designed to to stay secure on the foot without the stickiness. Fit up to size 12 feet (male or female). Ideal accessory to prevent tan solution staining your client's feet. Supplies in packs of 50 pairs. RECYCLE and dispose after use.